Ancient literature suggests that crucifixions — central to the story of Jesus’ death and resurrection — were common in Roman times, but there is scant archaeological evidence for the practice. Some scholars argue that since there was likely little concern for people who were crucified, their remains were simply scattered. A rare exception came in 1968 when a first-century funerary box was discovered with the remains of a man who had apparently suffered the grisly form of execution. 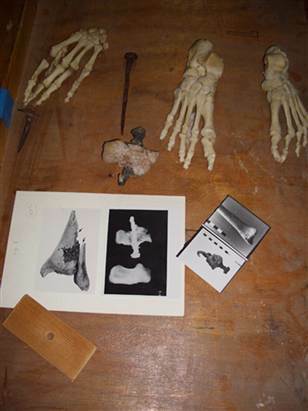 Analysis of the remains revealed that the feet of the crucifixion victim really were nailed to the cross — one of the foot bones, in the center of this image, has a nail driven through it from the side. The nail is bent, which is perhaps why it was left intact instead of being removed, according to archaeologists. The hand bones, however, showed no signs of being nailed to the cross, suggesting this practice often depicted in crucifixion artwork may not have always occurred. This entry was posted in Archaeology and tagged Archaeology, Cross, Crucifixion. Bookmark the permalink.